Superheroes showed up at school today. Captain America and Wonder Woman. And a Ninja. But the children told me a Ninja isn’t really a Superhero. Aren’t they smart! Superheroes give children and teachers an opportunity to impart goodness and knowledge, an “I can do it” attitude, and the will to keep trying. It’s the power of ‘yet’. Thank you, Superheroes! This entry was posted in behavior, Early Education, Expressing words and feelings, Inspiration, Kindness, Love, preschool, Teaching young children, young children and tagged Early Education, I Can, preschool, self esteem, Superheroes, teaching young children, The Power of Yet. Bookmark the permalink. Davy Crockett was a hero to me and he was super, too. At least, I thought so. And that’s why I begged my parents for a coonskin cap with a tail. But my real life (I know, Davy was a real person) Superhero was my dad. Nice post, Jennie. That’s a perfect story, Steve. Superheroes are those who give us hopes and dreams, and the will to “do”, whether it’s Davy Crockett or a Dad. Thank you, Steve! Like a superhero too! Way to go!! Thank you, John. Even though I was a Ninja 🙂, it’s a great message. Thanks for having such an open mind, Jennie. Well, thank you for those words, Dan. Much appreciated! Open mind + children = understanding and learning. 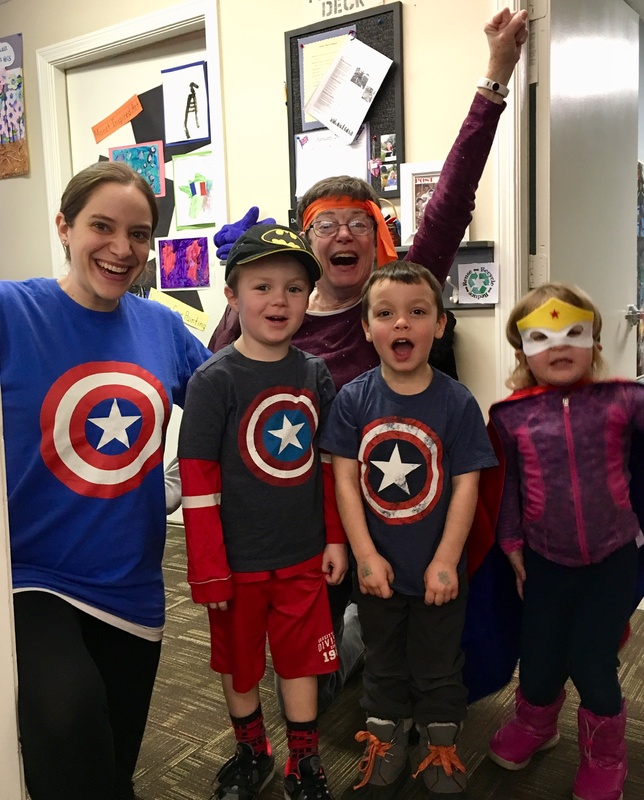 Here is another wonderful post from Jennie on children as superheroes! Thank you so much for sharing this, Charles. We all need some Superheroes to remind us we can do it! All children need heroes and superheroes. And I agree with Charles French that we big people need them too. I am always thrilled when I see Ninja Warriors beating the bad guys because I know I have fought the bad guys and didn’t win, so I want all children to win. They need to know that no matter how big or bad the evil ones are, there is a way for them to win. We are all superheroes within… EVEN Ninjas! So do you show them that “S” on your long johns? My little boy loves superheroes. He is only 2 1/2 but he can name almost all of them and he loves wearing superhero outfits. Superheroes give so much to young children, even at 2 1/2. Thank you! Wonderful post, Jennie. The world is full of superheroes. I love it when kids learn they can be amazing people who can do amazing things. Thank you, Diana. Isn’t that a wonderful thing! Much like a fairy tale, a superhero gives a child hopes and dreams. Children love superheroes and aspire to be like them (which is not a bad thing). Superheroes are inspirational provided that the children understand they are imaginary and that they can’t fly and do the things the superheroes do. Well said, Robbie. They’re much like fairy tales with a message of goodness and trying. I grew up reading superhero comic books. I love the fact that they stood for what was right and risked their lives to help others. I think police officers and fire fighters are modern-day superheroes. That is the nicest, most wonderful thing to say, Marlene. Thank you! I am deeply moved and appreciative. Have I ever told you that your comments help me be a better teacher? Really. You say it like it is, no fluff, all the good and important stuff. Thanks, Jennie. It’s just who I am. No fluff. I hate too many words too. 😉 A psychic at our church once told me I was a “gimme the facts ma’am” kind of writer. 🙂 So true. I just love what you say, and how you say it. Your no fluff really hits the soul. Really. Best to you, Marlene! It’s always a delight to read your inspirational posts, Jennie, and I especially enjoyed singing along with this one this evening. Thank you. It’s always a pleasure, Jennie.